Be unique and own an eclectic HEX TIE Honeycomb Peligro tie. 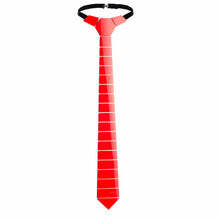 The tie includes an adjustable neck tie system which fits most necks. 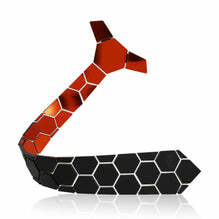 HEX TIE Honeycomb Peligro is made of lightweight glossy red acrylic. Assembled by hand, each tie reflects a custom setting, giving each piece a one-of-a-kind design. This eye-catching tie is sure to be a conversation starter, get ready to rock HEX!